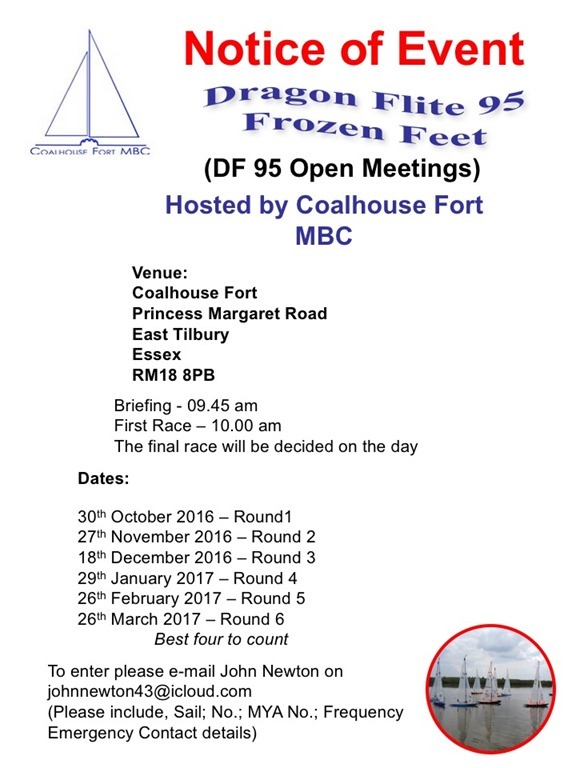 Following Round 3 of the Travellers Trophy for Dragon Force 65 boats at Chipstead on the Saturday, skippers moved on to Coalhouse Fort RYC for Round 4 for Dragon Flite 95 boats on Sunday 12th march 2017. On arrival at the lake, like the previous day, there was little or no wind and the forecast was for this to stay but with the addition of rain. Well the rain did not transpire apart from a little drizzle about lunch time, but the wind did improve after lunch. Following the skippers briefing Buzz Coleman, the Race Officer, delayed the first race for about 30 minute hoping the wind would suddenly increase! It did slightly, primarily from the south south west. and so 2 rounds of a triangle course at the southern end of the lake was set and the first race begin. 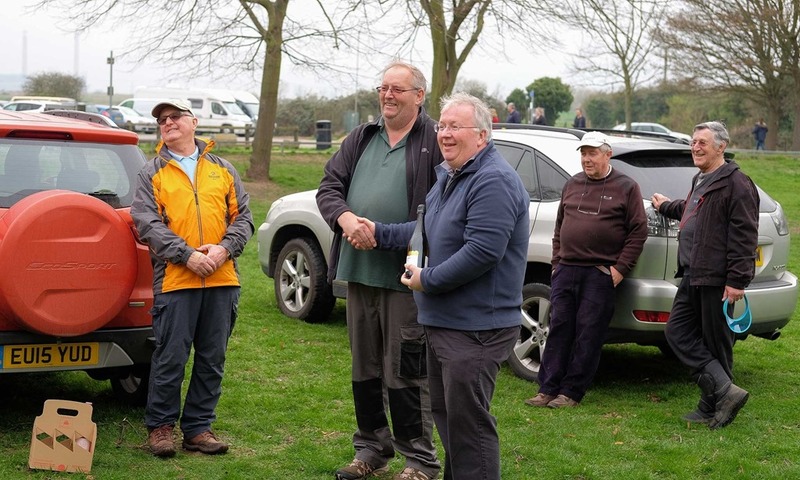 Whilst some of the top skippers , including Wayne Stobbs, John Tushingham and Tim Long managed to cope with the conditions, some of the newer skippers to the sport struggled such that the leaders had finished the race before some had completed the first rounding. These conditions continued for the rest of the morning with only four races being completed when an early lunch was taken. Having completed three races, one of which he won, Derek Priestley retired early to start his journey home. John Tushingham was obviously handling the conditions much better than most as after one discard, he was leading the pack on 5 points with Nigel Brown and Ken Binks following on 9 points and Tim Long, Wayne Stobbs and Derek Priestley on on 10 points. During the lunch the wind dropped almost completely and skippers were beginning to think was there any point continuing. But Buzz continued to watch the wind sock and eventually decided there was enough wind, primarily from the west south west to start the next race, with a change to a windward/leeward course still at the southern end of the lake. John Tushingham continued to dominate, apart from a battery issue in race seven which caused him to retire. After two discards John was still leading the pack, but Ken Binks after a bad start, was starting to show some consistency whilst Tim and Wayne were starting to drop away from the leaders. Meanwhile the rest of the fleet continued to struggle with Peter Spence, Liz Tushingham and David Lapes showing the occasionally in the leading group. Suddenly there was a wind change in direction to the West North West which meant a change to a windward/leeward course at the Northern end of the lake. With this change in direction, the wind gradually increased as well such that some quite fast races to took place allowing the remainder of the fleet to get closer to the leaders at times. Nevertheless John Tushingham maintained his lead whilst Nigel Brown with a couple of wins managed to improve his position whilst Ken Binks suffered a few issues allowing Nigel to eventually take second place. At the same time, Tim Long had three third places, but too little to late to challenge the top three, whilst Wayne Stobbs had three bad races dropping him well away from the leaders. The final positions therefore were a win for John Tushingham on 21 points, followed by Nigel Brown on 26 points and Ken Binks third on 33 points. Whilst the day had started with a big question mark with regards the wind, it eventually turned out to be a good day with challenges for everybody at times, but overall some great racing from skippers who in the main behaved themselves. Any infringements were resolved on the water with skippers doing their turns when protested such that no protest hearings were required. Our thanks to everybody who took part and we wish you all the best for future rounds. Our thanks also to the race team as well, including Buzz Coleman, Malcolm Schaffer, Dave Sellens, Mike Weston, Geoff Appleton and John Newton. Report courtesy of John Newton and Photos Dave Sellens. 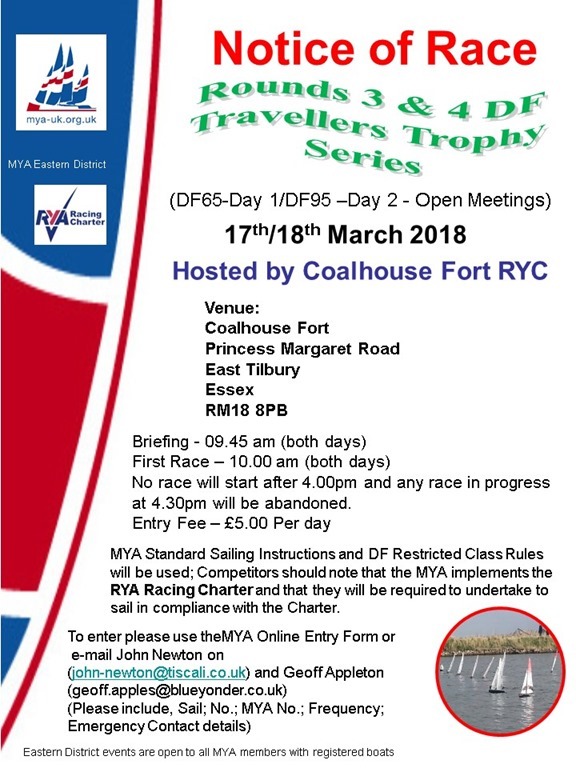 Round 4 of the DFUKA Travellers Trophy will be hosted by Coalhouse Fort RYC on Sunday 12th March 2017 at their Coalhouse Fort, Princess Margaret Road, East Tilbury RM18 8PB venue. 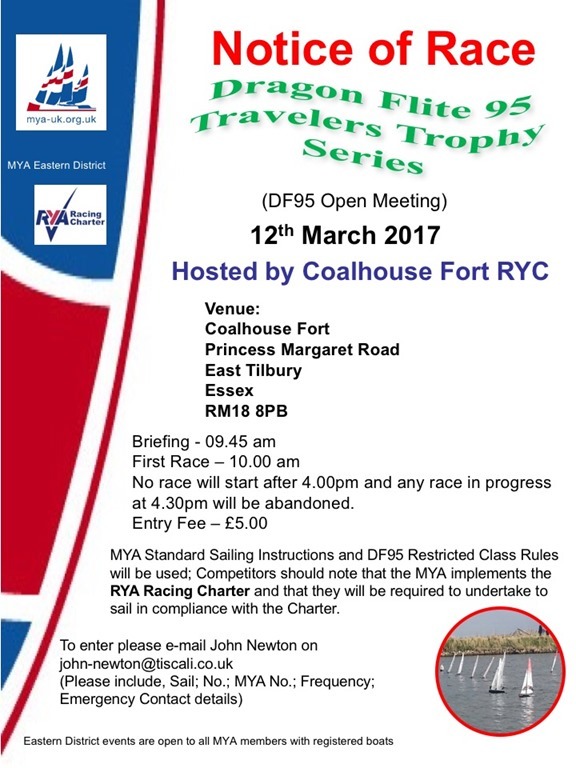 This event is open to all MYA members with a registered Dragon Flite 95 boat. To enter please email John Newton (john-newton@tiscali.co.uk) as soon as possible, including the following: – Name; Sail No. ; MYA No. ; Frequency; and Emergency contact name and number. Registration will be from 8.45 am with a skippers briefing at 9.45 and the first race shortly after. No Race will start after 4.00pm and any race in progress at 4.30pm will be abandoned. MYA Standard Sailing Instructions (SSIs) and Dragon Flite Restricted Class will be used. Skippers are also reminded that the MYA implements the RYA RACING CHARTER and they will be required to sail in compliance with the charter.